On the train, on the beach, on the sofa ... many people in all parts of the world enjoy doing wordsearches. 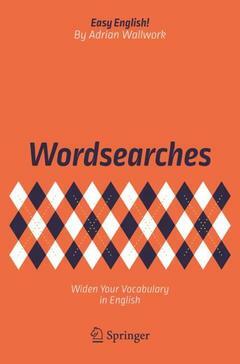 If you are studying English and want to learn and practise vocabulary related to various topics, then this book is for you! The topics reflect the kinds of everyday conversations that you might have both with native and non-native speakers of English. The topics are also those that are typically tested in English examinations e.g.TOEFL, Cambridge (First Certificate, Advanced), IELTS, and Trinity. doing short exercises to improve specific areas grammar and vocabulary, i.e. the areas that tend to lead to the most mistakes - the aim is just to focus on what you really need rather than overwhelming yourself with a mass of rules, many of which may have no practical daily value. Body, Appearance, Health.- Business and Finance.- Education and Work.- Family, House and Home.- Cooking and Food.- Free Time.- Technology.- Language.- Places, Travel and Transport.- Crime, Politics and Religion.- Time and Environment.